The first variety of Liberty Head Half Eagles is distinguished by the absence of the motto "IN GOD WE TRUST" on the reverse of the coin. 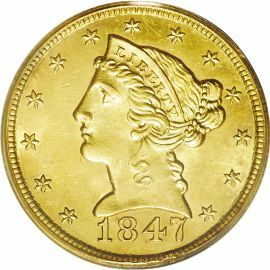 These coins were produced at the US Mint from 1839 to 1866 and replaced the preceding Classic Head series. 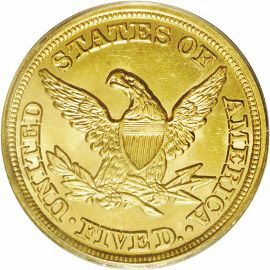 This 5 dollar gold coin was designed by Christian Gobrecht and modeled after the larger Eagle ($10.00) denomination that began in 1838.
surround the periphery of the design signifying the 13 original colonies and the date is below the central devices. The reverse of the coin is very similar to that of the Classic Head series. It shows an eagle with wings spread clutching arrows and an olive branch in its claws. The inscriptions read "UNITED STATES OF AMERICA" and "FIVE D." around the entire design.